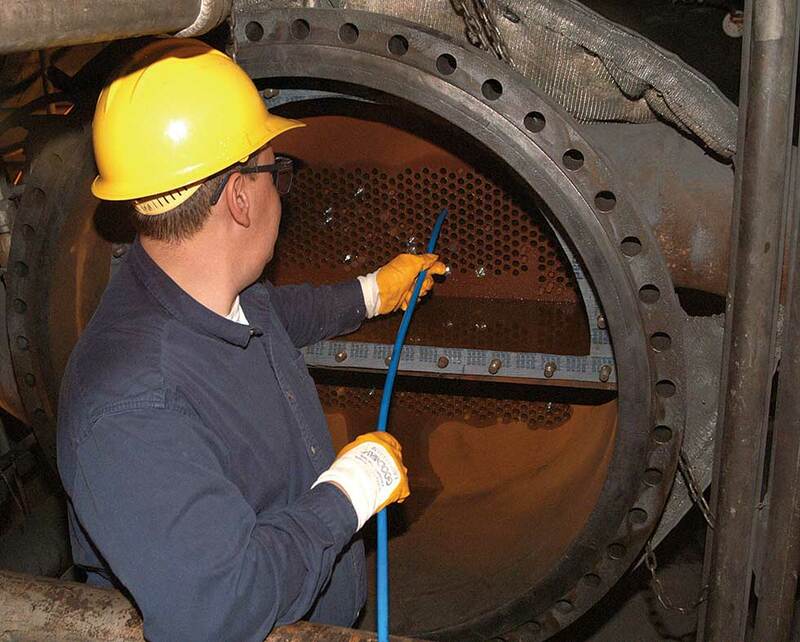 Goodway was the first company to develop rotary tube cleaning technology and our RAM-4 Tube Cleaner is the fourth generation of the original rotary tube cleaner. The RAM-4 Tube Cleaner Kit is our most commonly used package for cleaning TRANE, Carrier, YORK, McQuay and other popular chillers. It is ideal for cleaning tubes/pipes 1/4"-1" (6.4-25.4mm) I.D. 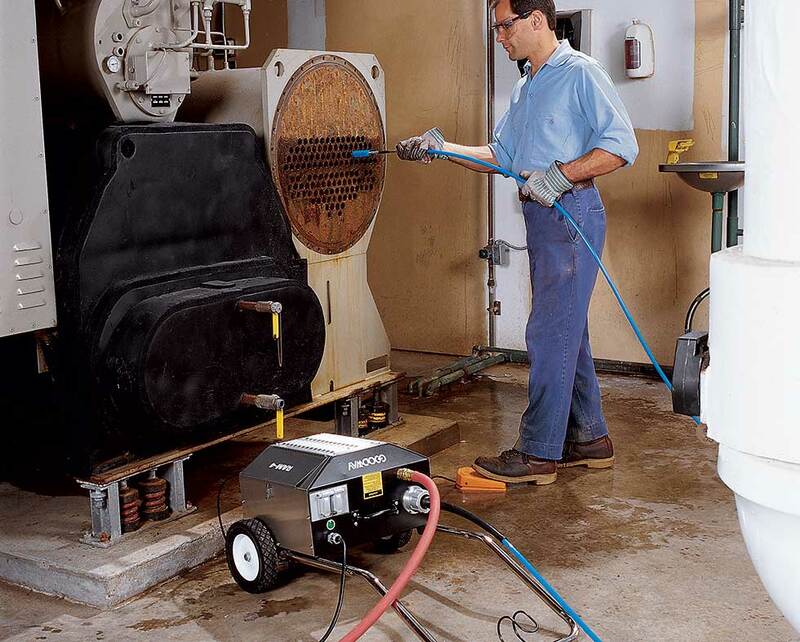 in chillers, condensers, evaporators, absorption machines and heat exchangers, and makes tough tube cleaning a simple, one-person operation. The RAM-4 uses a cleaning tool mounted to the tip of a flexible shaft. It feeds water through the casing to the cleaning tool, flushing out deposits as they are loosened. The flexible shaft snakes through each tube, unaffected by any bends caused by sagging. All brushes and tools are designed not to cut into the tube wall or get stuck in the tube. 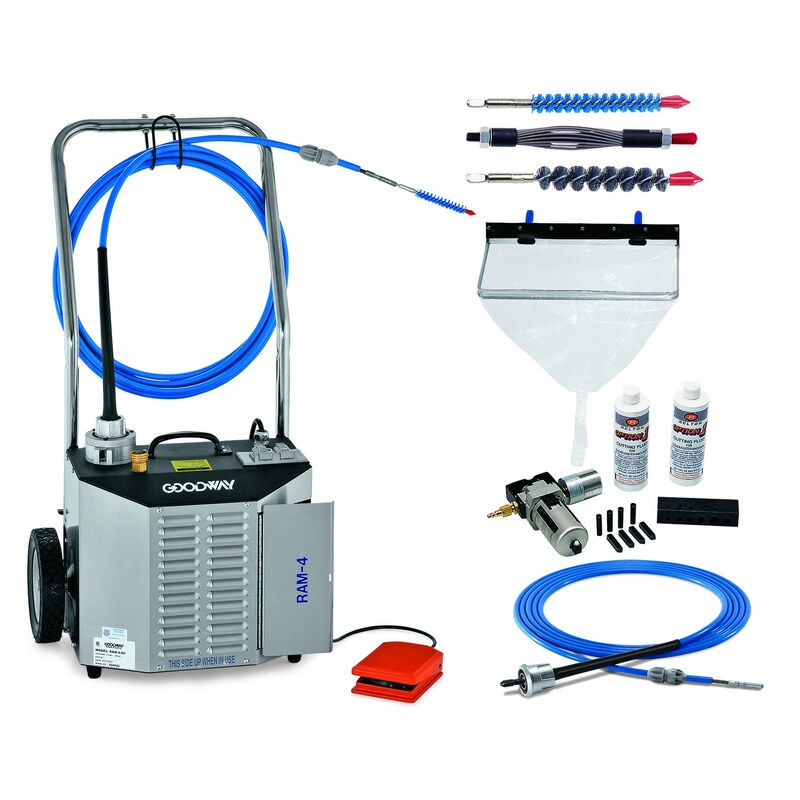 1 - RAM-4 Chiller Tube Cleaner (w/Bi Directional Foot Switch), 2 - GTC-703Q-25 Flexible Shafts, 1 - 9401 Chiller Bib Bag, 1 - 9402 Chiller Bib Frame, 25 - GTC-211Q Blue Nylon Brushes (Choice of size), 15 - SGBQ Spin Grit Brushes (Choice of size), 2 - GTC-205Q or GTC-206Q Buffing Tools, 8 - Replacement Blades for Buffing Tools and 1 - REP-703Q-KIT Repair Kit for GTC-703Q Flexible Shafts. Note: Quick connect and standard thread shaft/brushes available.